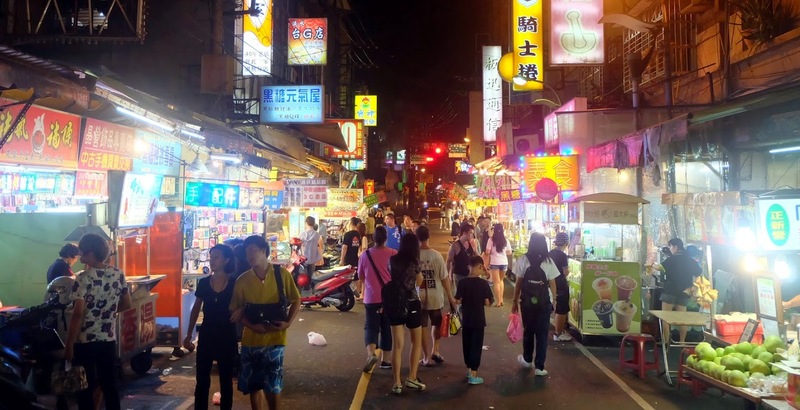 Night markets are a deeply entrenched part of Taiwanese life and culture, especially in smaller towns and cities, where they're the evening entertainment of choice for most people, with Karaoke coming in second. Most night markets feature a variety of games stalls, with shooting balloons and every possible variation of throwing hoops or darts at prizes, which are generally cheap, disposable toys imported from China. Many other "games" involve significant cruelty to live animals, and are often targeted at young children. Most night markets also have many stalls serving xiao chi (小吃, literally 'small eats'), for which Taiwan is particularly famous. Some night markets, most notably the famous Shilin Night Market in Taipei, specialise in these foods. 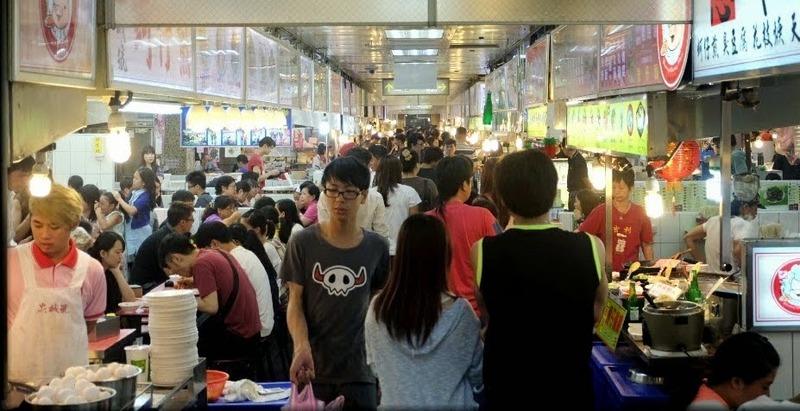 The Shilin Night Market is Taiwan's most famous night market. I don't recommend it, however: it's usually very crowded, almost dangerously so on Saturday nights, which might add to the appeal for some visitors, as it seems to for its regulars. The food stalls are underground, so the grease from the multitude of deep fryers, and smoke from the shallow frying, sit in the air, with perhaps its only escape being never ending stream of visitors' lungs and clothing. Food stalls sell every part of every animal cooked by every imaginable method. The vegetarian food stall, which used to make great dumplings, closed several years ago. Vegetarians and vegans may wish to go on a stomach which isn't too full (lest you lose your dinner) or too empty, as there are no good vegetarian restaurants nearby. It's better to eat in central Taipei, or in Beitou if visiting after a night in Tamsui. Some desserts may be vegetarian, but vegans should be careful of the shaved ice as the sauces often contain condensed milk. The attached clothing and apparel market is almost too crowded to be functional, and this is not helped by illegal hawkers who crowd up the already limited passageways with their portable stalls, ready to wheel them away to safety whenever police do the rounds. It's becomming increasingly aimed at tourists, with vendors selling overpriced, supposedly Taiwanese "souvenirs". The most essential advice I can give is not to go, but if you do choose to or get dragged there by Taiwanese friends take the MRT to Jiantan Station (one stop before Shilin Station, despite the name) and follow the crowds and then your nose. It's open from evening until very late. Taiwan's second most famous night market has a much more pleasant vibe. While still very crowded, being in the open air makes all the difference. There's also much better crowd management, with food vendors in the middle of the road and one-way foot traffic either side. It's located next to the impressive 250-year old Ciyou Temple (松山慈祐宮). The safest and healthiest meal at any night market in Taipei is grilled mushrooms from a small this small vendor. The large mushrooms are grilled straight over a flame, a much healthier adaptation of the traditional deep fried version commonly sold at markets in Taiwan (such as the Tamsui waterfront). A fiery hot chilli powder is sprinkled over them if desired. It's a little over half way down Raohe Street from the temple entrance (closest to the Songshan Station). Take the green Xindian line to its terminal at Songshan Station and follow the signs. Alternatively if coming from outside Taipei take the local (TRA) train (also to Songshan Station). It would be worth stopping here after an evening at Jiufen, in which case take the local train back from Riufang and then the MRT back to your hotel.